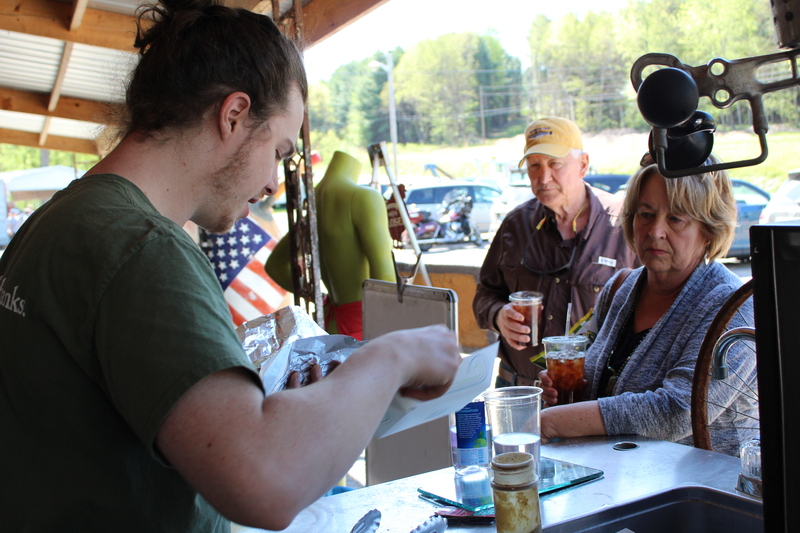 It’s late afternoon on Saturday at Paradise Point Marketplace in Scottsville, nearly a 40-minute drive from downtown Bowling Green, and the smell of steaming hot dogs mingles with the warm April air. Max Erskine, 23, a Paradise Point employee, uses metal tongs to pick up individual hot dogs, which he then places in poppy seed buns and hands over to customers of the marketplace. Per customer request, Erskine has celery salt on hand and jumbo-sized dogs in the steamer, weighing a quarter of a pound each. Max Erskine, 23, a resident of Scottsville, is seen serving hot dogs to customers at Paradise Point Marketplace, located in Scottsville. As Max prepares hot dog after hot dog, his mother, Sebrina Erskine, 58, co-owner of Paradise Point, stands behind a cash register inside the store and greets customers while a mix of 70’s pop and R&B hums throughout the market. He only stops when needed at the market’s soft serve ice cream machine or bakery. Amid the market’s assortment of everything from clothing to artwork, Paradise Point Co-Owner John Erskine, 61, Max’s father and Sebrina’s husband, can be seen speaking and laughing with customers as Max’s girlfriend, Alexis Corbin, 23, also a Paradise Point employee, arranges plastic utensils and condiment jars while sporting a yellow sundress. As the sun sets and business dies down at the market, Max wraps tarp around an outside dining area, enclosing the area’s booths, tables and a number of adorning canvases painted by John Erskine in a black wall that will remain until morning. Max then checks the outside of the market once more and walks to a nearby shed-like building, which he unlocks. As he enters the building and flips on a light, the light illuminates a shelf filled with vinyl records, a mass of instruments, and thousands of dollars worth in audio recording equipment. After graduating from Middle Tennessee State University, or MTSU, in May 2017, Max opened his own recording studio, Erskine Sound, in the building. Since officially recording his first artist in September 2017, Max said he has recorded in the space for nearly seven separate projects. 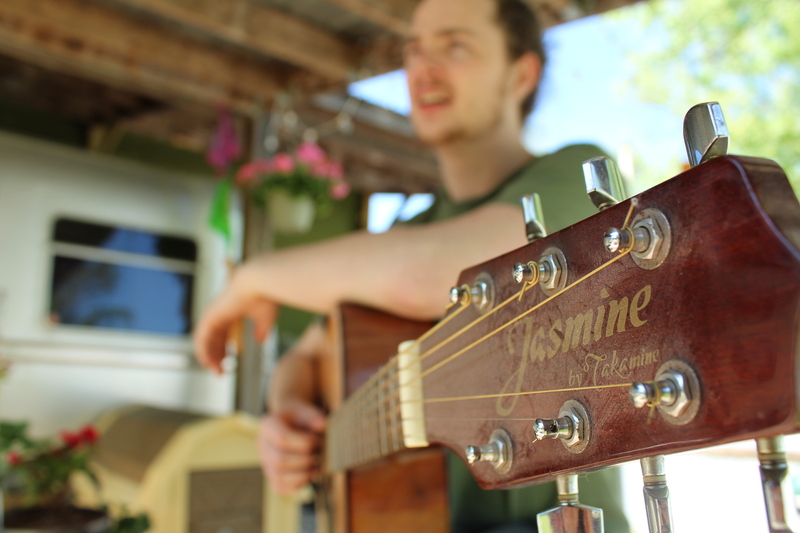 Despite working both a full-time and part-time job, Max makes time to work on projects at Erskine Sound between three to four times per week, attempting to find success in his true passion––recording music. After receiving a guitar as a birthday present around seventh grade, Max said he first became interested in music and the creation of music. Within the year, Max said he started recording music for himself and his friends. As a freshman in high school, Max said he started buying audio recording equipment, which he said he used in a makeshift studio set up in his parents’ basement. Though he had performed music with friends from his neighborhood, Max said that recording music was what interested him most. After a high school counselor informed him about a recording industry program at MTSU, Max said he applied to MTSU and discovered that he qualified for in-state tuition at the university, given that no recording industry programs existed at any Kentucky universities at the time. As a student at MTSU, Max said he learned about audio production and entertainment technology and recorded professionally for the first time at a studio on campus. During his last semester at MTSU, Max said he accepted an internship at The Tracking Room, a professional recording studio in Nashville, where he said he interacted with clients and learned about the business of the recording industry. Though Max said his initial post-college plan was to get a job as an audio engineer at an established studio, he said he ultimately decided his best option was to return home and start his own. “Initially, I planned on just, kind of, working small jobs until I could get a job at a studio, but, you know, it’s a very competitive field,” Max said. Since starting production at Erskine Sound, Max said he has enjoyed the opportunity to record various local artists at the studio. However, he said he plans to continue expanding on the studio, and that he has been surprised by the amount of work operating a studio properly requires. A look inside Erskine Sound studio. From paying utilities to dealing with the disadvantages of recording in a single room studio to vying for credibility and clientele, Max said the initial startup of Erskine Sound has been gradual and trying. Along with currently working three days per week at Paradise Point, which will become seven days per week during June and July, Max enters inventory, sells, cleans and works with instruments and audio gear every Tuesday and Thursday at Musician’s Pro, a small music retail shop in Bowling Green. He said he works at Musician’s Pro primarily to fund Erskine Sound. 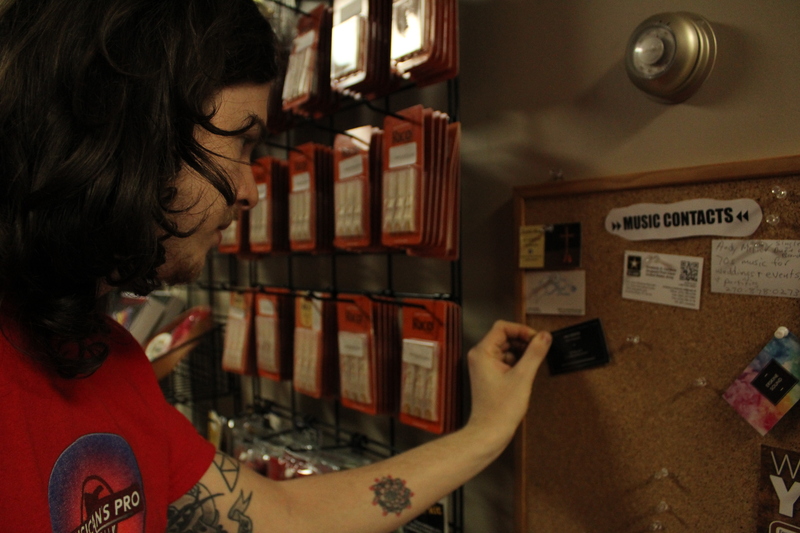 Max Erskine places an Erskine Sound business card up on a bulletin board at Musician’s Pro, located in Bowling Green. Max said he typically earns just a little over $500 per month for recording, editing, mixing and mastering songs. 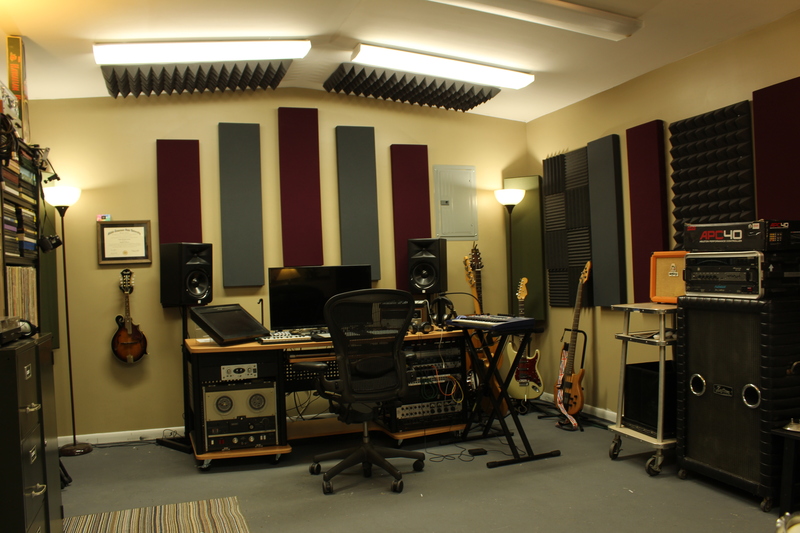 Given that Erskine Sound is still in need of better equipment and a number of renovations, according to Max Erskine, all money earned from the studio is saved for improved gear and renovations. In order to live as cheaply as possible, Max moved into a 25-foot aluminum 1960s style camper near Paradise Point and Erskine Sound with Corbin and his pets, a German Shepherd named Pepperoni Pizza, or Pepper, and a cat named Breadsticks, in June 2017. Max said he believes the location of the camper is convenient, but that his primary reason for living in the camper is to avoid unnecessary costs and save for Erskine Sound. Max Erskine sits outside his camper and takes a break from playing a guitar he said his sister gave to him in exchange for a cupcake from Boyce General Store, located in Alvaton. Though the camper contains a bed, a television and a sink, Max and his girlfriend must cook and store food in the kitchen at Paradise Point. Corbin said that she and Max typically live in a minimal fashion. “We could definitely live off food stamps,” Corbin said. Max said his experience with working multiple jobs while trying to balance Erskine Sound has been difficult but necessary. Max said he understands that finding success as an audio engineer demands commitment, which he said he believes he has. “A lot of people want career level results for a hobby level commitment, and that’s just not going to get you anywhere,” Max said. Sebrina Erskine said she supports her son’s decision to open Erskine Sound, but acknowledges that his choice to invest in an artform is one that requires time. Regardless of Erskine Sound’s difficult startup and limitations, a number of local artists have recorded with Max Erskine. 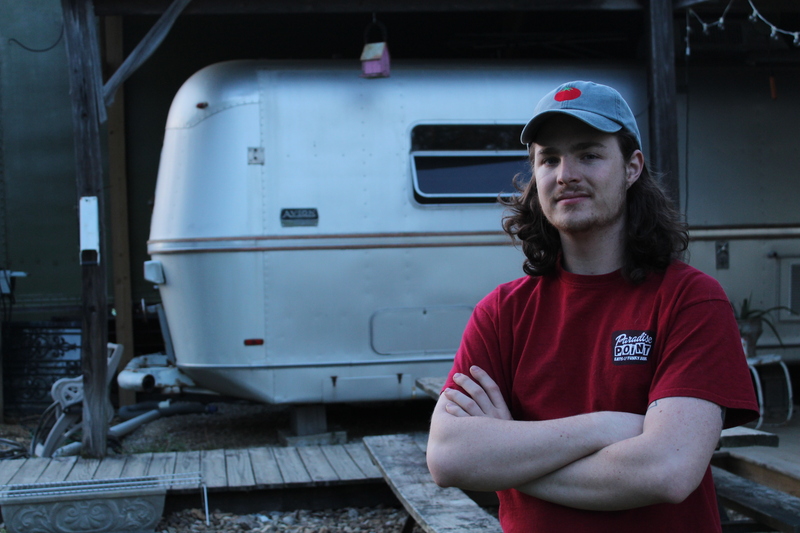 Russellville resident and Logan County High School senior Cody McElfresh, 18, recorded his debut EP, Along The OceanSide, at Erskine Sound in September 2017. McElfresh was the first artist to officially record at the studio and is currently in the process of recording again with Max. 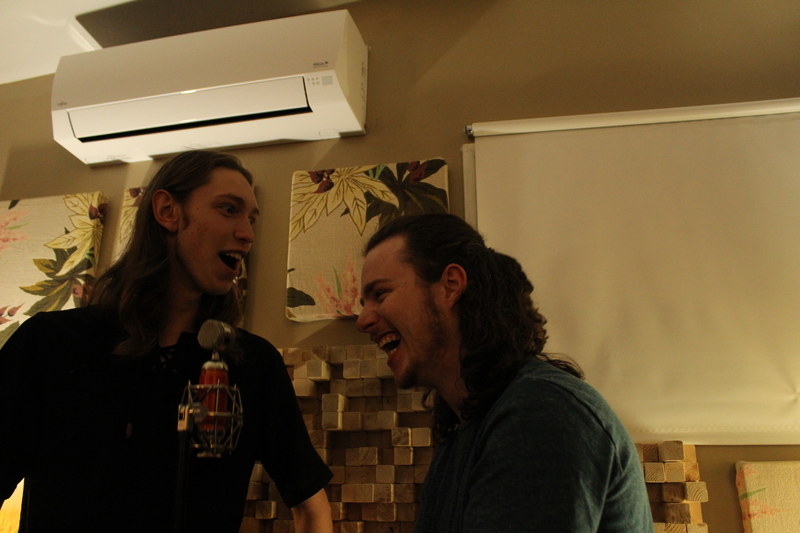 Max Erskine and Cody McElFresh, 18, a Russellville resident, are seen laughing after a recording session at Erskine Sound. Bowling Green resident and pianist Spencer Woods, a high school friend and Max’s bandmate, has recorded with Max Erskine on multiple occasions, twice at Erskine Studios and once while Max Erskine was a sophomore at MTSU. Woods said he believes Max is a talented audio engineer, though he currently lacks credibility and interest from potential artists. Woods also said he believes Max Erskine is at a disadvantage when compared to other studios in Bowling Green, given he works alone. Max said credibility and interest from clientele has been a particular struggle for him, despite his experience and education in recording music. Because anyone has access to buying recording equipment and learning how to record music, Max said he believes the audio recording field is over-saturated. Along with an over-saturation of at-home engineers, Max said he realizes that his studio is less than professional, given that the area in which he records artists and the area in which artists record is not separated. He compared Erskine Sound’s setup to that of a dysfunctional restaurant, but said he believes his product is still worthwhile. Corbin said she believes Max has done well with the number of clients he has recorded, and that she is proud of him for the progress he has made. Sebrina Erskine said she believes Erskine Sound has potential, considering its location and unusualness. She said she believes the future of the studio is uncertain, but that she is hopeful. Max Erskine outside of his camper. Though Max Erskine said he acknowledges the repercussions of his decision to invest in Erskine Sound, he said he is excited for the future of the studio, and that he hopes to continue helping others succeed while also succeeding himself. “I want to use my skills to help other people push forward and get to the places that they want to be, because that ultimately helps me get to the place that I want to be,” Max Erskine said.